Villa Blueberry is located adjacent to Villa Strawberry (326776). These two villas can be rented together for large groups of up to 20 persons. This Private villa rental in Malta is a 5 bedroom villa with private swimming pool currently on offer as a self-catering holiday home in Malta. Only just recently re-converted by owner, this holiday villa offers a good standard of private holiday accommodation in Malta for travelers seeking privately owned villa holidays of this kind on a self catering basis. Self catering means you have the facility to cook your own meals or choose to dine at a restaurant of your own free choice. This Villa is located in the southern part of Malta - limits of Marsascala. Nearby towns are Marsaxlokk and Birzebbugia. These three villages have several specialized fish restaurants, cinemas and many other leisure facilities. This farmhouse is ideal for 1 or 2 week holiday breaks. Self-drive cars can also be arranged. The property enjoys 360 degree views. A sitting/ living room, a kitchen/ dining area and a bathroom at ground floor and five bedrooms all with ensuite bathrooms. €300 damages deposit to be collected in cash upon arrival which will then be refunded on check out after full inspection of villa. Holiday Villas Malta is a family run enterprise and we strive to provide Holiday accommodation that is unique, typical of Maltese warmth and hospitality, and above all of very high standards. We take personal care in ensuring that our Villas provide all the expected amenities and personally handle tenant issues. The Villas were designed and built by the owner, Chris Cachia, an architect by profession with a keen eye for aesthetic detail as well as an expert in Maltese architecture. Chris has ensured that the Villas retain the local style in both design and the authentic building materials used. They are all built to high standards, with large rooms and wide open spaces. Chris gave special attention to natural lighting and ventilation to ensure that the occupant enjoys the Maltese sunshine even when indoors. 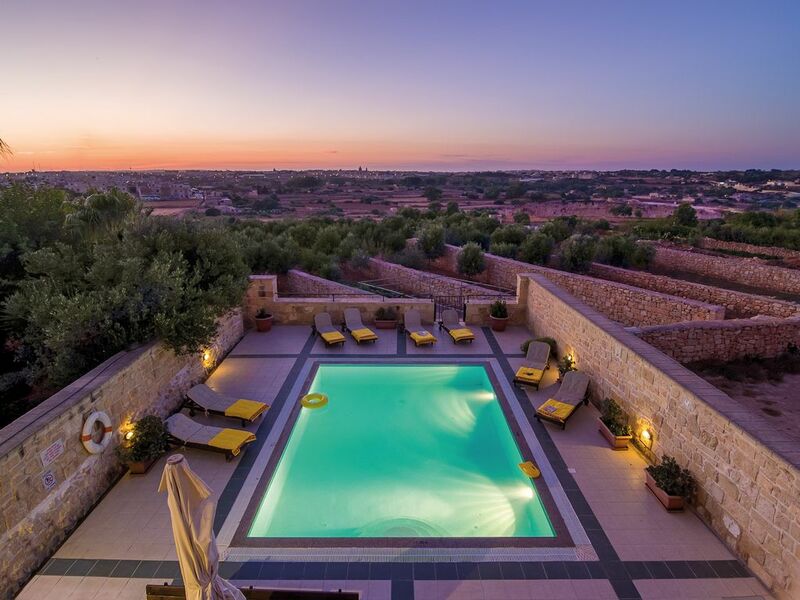 Mrs. Josette Cachia, the owner's wife handles client queries and manages the day to day running of the Villas which includes managing a team of plumbers, electricians, pool maintenance staff, cleaners and so on. The Cachia's home is very close to the Villas and they are always prepared to help. A/C (cooling and heating) is available by means of a 'pay/use coin machine'. We had an amazing week, the villas are really beautiful and we definitely will book again. Beautiful home. Great kitchen and property. Josette is great! We loved sitting on the back terrace enjoying the distant views of Valletta. The kitchen is huge with a marble topped table big enough for 10 people. Beautifully furnished with antique furniture. 5 bedrooms (4 on 2nd floor, 1 on 3rd floor), each with its own bathroom plus full bath downstairs. Josette was at our “beck and call”, answering texts, coming over in person, etc. Thank you! Parking is a bit tricky as is driving around Malta if you rent a car! But the buses are very easy to use. One stop is right at the villa to Marsaxlokk. One to Valletta is about 400 meters away. €1.50 per person good for 2 hours with transfers. Tip: Use Google Maps public transportation to check bus schedules and locations! Hi Terri, thank you for staying at our villa and for your kind and positive feedback! It is our pleasure to have guests like you and you're welcome to stay again any time! The villa is large and each room has an ensuite. The pool is large and the outside area is attractive. The kitchen is a great size and fairly well equipped. The living area is nice and the snooker table is a real plus. The beds are very hard and mattresses of poor quality. The sheets are equally poor for this kind of property. The pool was dirty and had algae growing around the sides and the water drains all round the pool were broken and cracked in many places which would be dangerous for kids. Despite promises to clean/fix this was not done by the time we left after a week. On arrival a bunch of things were broken - including the air conditioning meter, bulbs, outside lights, kettle. While some of these were addressed reasonably quickly many were still broken when we left. The specific location is on a main road near a narrowing point and you have cars and horns going from as early as 6am. The roof in the top room leaked and the room became quite damp. The owners say they fixed the problem but we did not have further rain to verify. The TV and AV is not great - apparently the TV was new but it is linked via a very noisy SCART cable to a very old satellite box and on many channels the hum was unbearable. There is no DVD player which was a surprise for this type of property. While it was easy to report issues and promises were made many things were not resolved. The owner explained in so many words "It is the end of the season, what do you expect" Well for this kind of money I do expect to at least get what we have paid for. Additional things such as Internet are very expensive - and given the problems we had the least we expected was an apology and some small concession such as the £70 for Internet to not be charged - but sadly neither were forthcoming. I cannot recommend this property for families - better for large party type groups of younger people. Maybe customer service norms are different in Malta - it was our first time there - but the owners did not provide what we have experienced in Greece and France. The guests requested early check in and we managed to get extra cleaners to manage a check in at 11am instead of 2pm. They checked in at 11am (3 hours before the actual Check in time). We told them that we still had some minor repairs to do and we agreed that while they were out we would do these small jobs. The guest wanted free wifi but we informed them that there was a charge for that. Following this these guests were inventing all types of excuses to complain. We accommodated all requests and complaints including a request of a small water leak that was reported at 2am (in the middle of the night). We run several villas and we know that some guests are more demanding than others – however some guests can never be happy no matter how hard we try to accommodate their requests. We responded within minutes to all the requests and we informed these guests that the wifi and some other services were against a charge. They insisted that wifi was free. And they vowed that they would write a bad review on our villa. This is the reason we are writing a review on this guest. We rarely review like this to our guests and this can be checked in all our villas that are advertised on Homeaway. We enjoyed our month at Blueberry Hills vey much. Josette and Chris are perfect hosts! The house is perfect for a family as the pool is really big and very inviting! As the building is made of very thick honey-coloured limestone the rooms remain cool even on the hot days. Great kitchen. We only went out for dinner 3 times! We highly recommend it! Thanks Chris and Josette! Hi David, thank you for staying in our villa! It was such a pleasure to host all of you the whole time and we look forward in welcoming you again any time! Very beautiful house with great pool area overlooking the countryside. We rented a car so that we could go around the island very easily. We had no problems even though we were travelling with two small kids and my in-laws. Would definitely stay there again! We loved the pictures of this house on Homeaway but the pictures do not do it enough credit. Although we arrived late at night it was no problem for the owners, they waited for us and greeted us with a smile. The house is very beautiful and clean and the pool area is very big with beautiful views. Would surely recommend it! Marsascala offers you a relaxed atmosphere while still boasting a myriad of activities. The immediate area includes a number of well known restaurants and entertainment venues. Be it a quick snack or a full blown fish banquet, it is only a short drive away. You can walk along the picturesque promenade while on your way to dinner and get to know the locals who will undoubtedly be coming from or going to the same restaurants. An evening walk or an early morning job along the popular Marsascala promenade is an experience in itself. Marsascala is also very close to the old town of Zejtun which is a typical Maltese Village surrounding a church. At Zejtun you can truly experience the Maltese way of living. The well know fishing village of Marsaxlokk is also close by. Like Marsacala, this village is much sought after for its fish restaurants. Marsaxlokk is very popular with tourists and locals alike for its fresh fish market which is set up every morning. You should reserve a morning for a stroll through this busy market and enjoy seeing fresh Mediterranean fish being sold and then order a fish lunch in one of the many restaurants that encircle the picturesque bay. The bay is usually full of traditional Maltese fishing boats unless you visit during a time when the fishermen are out fishing of course! Check in time is from 2:00pm. Check out time is 10:00am or earlier. Air Conditioning (Cooling and Heating) is available by a pay/use coin machine. No parties/disco can be held in the villas and maximum number of persons booked is not to be exceeded unless this is approved by the owner of the villas. In case of breach of this condition the villa will have to be vacated immediately and any payments will be lost. A welcome pack will be included for bookings of 7 nights or over. As from June 1, 2016, the Government of Malta is introducing an Environmental Contribution on stays at all types of accommodation. If you are 18 years or older on the day of arrival, and starting your stay on 1st June 2016 or after, you will be required to pay an Environmental Contribution amounting to €0.50c per night up to a maximum of €5 for each continuous stay in the Maltese Islands, including twin-centre holidays in Malta and Gozo. This applies to local and foreign guests staying at any type of accommodation including hotels, guesthouses, farmhouses, villas, hostels, self-catering apartments, b&b, host families etc.